Click on the control or select from the list below to jump to more information. Several features have been added to speed up the process of comparison. First, previous comparisons can be saved by pressing the [Save] button. Saved comparisons can be reopened from the Comparison combo box. Next, previously selected files are listed in the combo boxes for File and Compare With. This gives an alternative to selecting a file using the File Open dialog [...]. Saved comparisons can be reopened from the Comparison combo box. In this box also is available the <last comparison> you did. Selecting the empty line clears all wizard selections. Press the X right of the Comparison combo box to remove the selected saved comparison. Previously selected files are listed in the combo box. ... Use the [...]-button to open the File Open dialog. Select file to compare with. 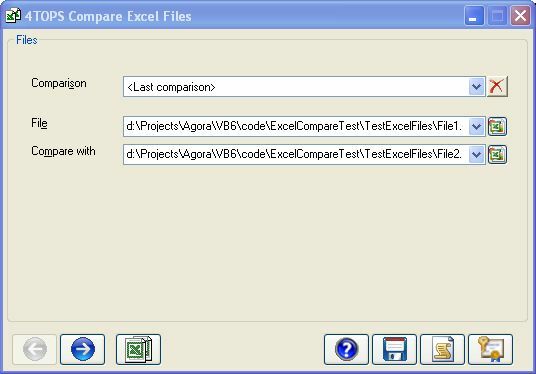 You can select the same file if you want to compare two worksheets located in the same file. 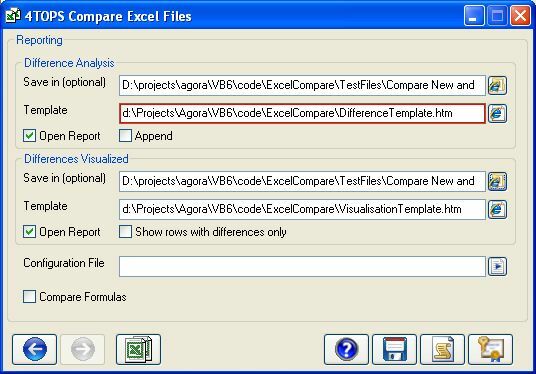 Specify which Worksheet in the file to compare. Optionally specify one or more Ranges. Specify which workheet and Range to CompareWith. First row in the sheet to start comparison on (default value 1). If left empty then comparison continues until no more rows are available for comparison. This indicates which column contains the value that can be used as an identifier for the record. The selected column is tested to see if it is usable as a key: no duplicate values..
Indicate which columns should be excluded from the comparison. This can be useful if a certain does not contain interesting info, or if it is used for a different purpose and as such not to be considered part of the table. The Difference Analysis is the shortest, only telling what differences have been found. Differences Visualized shows the parts of the Excel File containing the data with special marks for added and removed records and for individual cells both current and previous values. Both reports are in HTML. This makes the presentation very readable and allows for a direct move from a line in the Difference Analysis to the corresponding location in the Visualization report using a hyperlink. For an example see Comparing tables in worksheets. You can choose to have the reports generated under a given name and whether you want it to be opened. If you leave [Save in] empty and remove the check from [Open Report] the report is not created. Specify the file name you want to save the report with. Select a template to use for the report. Allows for Customized reporting. If not checked the new analysis will overwrite existing file. If Append IS checked the comparison results are appended to that file. Show rows with differences only is useful if the number of changed rows is limited. The other fields in this group have the same meaning as described with Difference Analysis above. By default to save time only data are compared. Check this if you also want to find differences in formulas.